For the fifth consecutive year, Famoso Neapolitan Pizzeria is partnering with Mealshare to help end youth hunger in Canada, one jar of tomato sauce at a time. On now through December 31, 2017, one meal will be provided to a Canadian youth in need for every jar of Famoso’s famous hand-milled Campania Tomato Sauce purchased, right in the community in which the sauce was sold. Mealshare’s mission is to enable and inspire people to join the fight to end youth hunger. Funds raised from last year’s Campania Tomato Sauce sales provided 16,115 meals to in-need youth across Western Canada and Ontario. Since Campania Tomato Sauce sales began in 2013, 22,368 jars of sauce have been purchased to support the 17 local communities in which Famoso operates. Made from only the finest vine-ripened plum tomatoes, picked from the rich soils of Mount Vesuvius in Naples, Famoso’s Campania Tomato Sauce is hand-milled and jarred to capture authentic Neapolitan flavour. 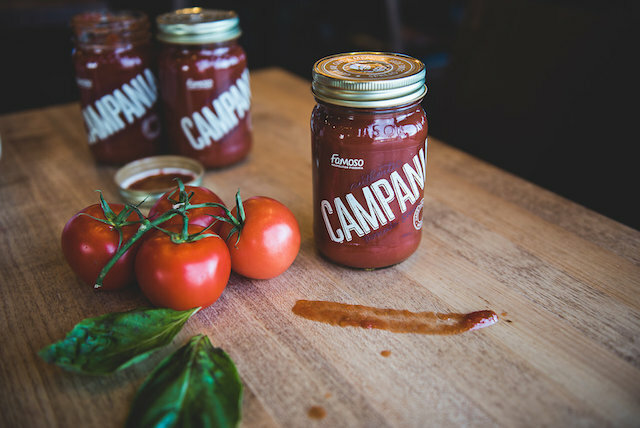 Available only once a year during the holiday season, Campania Tomato Sauce retails for $8 per 500mL jar. I will draw one winner at random from all entries at 12:00pm on Friday, December 22, 2017. Follow Famoso on Instagram, Facebook or Twitter for more info. Our family loves Famoso. That sauce sounds really good! Hope it works in Kelowna’s new location! Never had it before but will now be alert to opportunities. Love the Commercial Drive location. Had no idea there were locations in the Surrey and Abby! Free pizza is the perfect Christmas present! Thanks to Famoso Neapolitan Pizzeria and Mealshare for making a difference! Great way to share with friends. I would like to try Famoso’s sauce! Yummy pizza and a great cause!! Would be great to win this gift card! The birthday with Famoso pizza was the best! Would love to celebrate again! One of the best pizzas I have ever had! I have always wanted to try their pizza. There’s one close to my work so I’d love to win so I can go and have my co-workers join me! One of the fam’s favourite restaurants! Love pizza, thanks for the chance! Can’t imagine anyone not loving pizza! We’ve been to the one in Victoria … soooo good!! I need to win this!! I have never tried Famosa and have always wanted to try it!! Thanks for your always awesome contests Miss 604. Love your blog! Would like to enter this contest for your restaurant. I’d love to have another reason to head to Commercial Dr to soak up the sights and sounds again. we have wanted to check them out! Wow what an awesome giveaway and a chance to help others!! Thanks for the chance! I didn’t know they had so many more locations in BC than their Main St one. Thanks for sharing. Love Famoso: fast, friendly, and reasonably priced. I still haven’t been to Famoso, but I would love to try… pizza is my favourite!! We love spending quality family time at Famoso, enjoying wonderful pizza. 🍕🍕🍕🍕🍕🍕🍕 Thanks so much. Oh, their pizza is SO good! Would love to win and take friends out for dinner one day! My family would love to try Famoso pizza.. Thanks for this amazing opportunity to make this happen..Miss 604! Merry Christmas to you! I would love to try that sauce. I dined at Famoso Neapolitan Pizzeria about a year ago. They make fantastic pizza. Great place for Christmas gathering. I’ve heard such good things about Famoso. I’d love to try. My family would love a meal out here. Oh I love a good pizza! Mmm pizza is my favourite food. This sounds like a pretty tasty prize, I’ve not been tot hat place but walk past it often. oh man. I love this place. The Famoso pizza is soooooo good!!! I love the pizza but didn’t know about them working with Mealshare. Great contest and great info about a local business. i love margarita pizza its my absolute favourite!! Would love to finally try out their pizza! Who doesn’t love pizza? Great cause. Good for Famoso! I live right around the corner from Famoso and it always smells so good. I’ve never dined at Famoso before, so if I’m lucky enough to be picked, I definitely want to dine at Famoso for my first time! Great way to promote this campaign in this season of giving! Their Cavoletti is my favourite pizza! Their pizza is pretty good. Oh, this is a great prize!